Inside: See how goals progressed in February. February went fast. It’s almost like it is shorter than other months or something crazy like that. March looks like it will be busy with paperwork, school stuff and then we get spring break at the end of the month. That will be a nice breather! This past month, soccer practices and games started up again for my daughter so I’m back to being a soccer mom. We also signed my son up for high school classes. Ack! Already? Despite how fast time seems to fly by, I did make progress on the goals set for the year. My main health goal this year is to lose some weight. Or, more specifically, reduce my waistline. Why? Well, the past few years I haven’t been as active as I was in the past. That, combined with a huge slow-down in my metabolism (thank you, aging), well…I’ve gained a bit of weight. In the past, losing a few pounds wasn’t a huge deal. I grew up as a “beanpole” that could eat anything and not gain an ounce. My ribs and hip bones jutted out even though I ate plenty (and junk food at that). But, once I hit about 32 the all-you-can-eat days came to a grinding halt. Suddenly, I was gaining a couple pounds here and there and had to work really hard to take them off. Now, I’m about 25 lbs heavier than I was on my wedding day and would love to lose about 15 pounds. But more specifically, 4 inches from my waist. It is unrealistic to hope to lose 4 inches from my waistline this year. But 2 inches is probably doable. My goal for the workout schedule lately is to exercise 5 days per week and burn off about 850 calories total per week. So far, I’ve been working out 3-4 days per week and burning off 300 to 400+ calories during each of those sessions. So, while I haven’t been meeting my workouts per week goal, I exceed the calorie goal. Speaking of calories, that is what I need to work on next: calories going in. Yep. Gotta watch those snacks. Overall progress in February? I’ve lost approximately 2 lbs total so far this year, and not quite ½” from the waistline. I am increasing my endurance during cardio and I’ve been increasing the amount of weight I can lift. We were waiting for the all-clear from my husband’s work before rebalancing our portfolio. His 401(k) management company changed, so he was in a blackout period for a couple months. You may notice we decreased our REIT exposure a bit. We changed to different ETFs for that and in the process, took a peek at the exposure to real estate in the other funds. Overall, our real estate exposure is about 15% if you include what the other funds invest in as well. It is a bit more than the 13% overall exposure for the economy, but we’re fine with that. Other changes we made included changing up our bond holdings a bit to include more corporate bonds and eliminate bonds that held mortgage-backed securities. And, to be honest, our allocations aren’t quite there yet. My husband still has 401(k) contributions going into his account this year until about May. I set it up so with the rest of his contributions going into the small-cap fund, the small-cap portion should be 10% of our portfolio with his last contribution. Or rather, where our portfolio would be if the market would stop changing. Yeah, it’s hard to hit a moving target. Here you can see how our portfolio did last month compared with the S&P 500 (screenshot from our Personal Capital account). While our portfolio was down, it did ok compared to the market in general. Our net worth did take a hit in February. But if you look at the graph, we did still manage an increase since the beginning of the year. The market gains in January mostly contributed to that. In February I concentrated on decluttering the kitchen, not including the desk area. Overall, I have cleaned out many things. Organization is still a work in progress. I basically want to swap the contents of some cupboards around, but there is no hurry. At least now there is room to do so. Besides old food, what did I get rid of? Yes, there is a bit more I can do in the kitchen, but it is time to move on to another room. This time? The office. Honestly, I think this project may take more than a month. One reason is that we are attempting to go mostly paperless so after organizing all the paperwork, we’ll be scanning and shredding. It wouldn’t be quite as much work if I could convince my husband that, no, we really don’t need the water bill from 5 years ago. But if scanning it in will allow me to shred the thing, then so be it. Besides the normal bills and whatnot, I am also hoping to scan in boxes upon boxes of genealogy stuff before shipping it off to my parents. So, it will take a while. The genealogy stuff will probably be last for the paperwork in that room, so if anything there extends beyond March, it will be that. 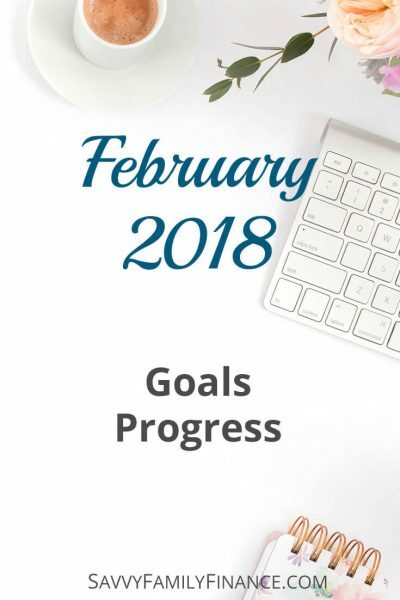 Because last month I finished creating savings sub-accounts and have automated deposits for them, AND in February I rebalanced our portfolio, it seems like I should set another goal or two. Is it bad to set easy goals and wrap it up early? I don’t think so. These are all attainable goals and I know I would be overwhelmed by too many lofty goals that would take a full year. This process of making smaller goals seems to work better. Before college, I was a voracious reader. Whether it was all the assigned reading or just being busy, that all went away during college. Years would go by without me doing any reading for fun. Just a couple years ago, I started reading for pleasure again and would like to keep it up. New goal: read at least two books a month for fun. What I’ve read so far this year: the entire Girl in the Box series by Robert J. Crane, Little Fires Everywhere by Celeste Ng, and Look For Me by Lisa Gardner. Ha! You know all that decluttering I’m trying to do? Much of it is being donated to either Goodwill or the school rummage sale. The rest really should be listed on Craigslist or taken to a consignment shop or something. My son even has a bunch of Pokémon he wants to sell. We made slow and steady progress in February. While our net worth was up a fair amount in January, it took a bit of a hit with the markets in February. So, while our accounts had a negative return this past month, for the two month period, we are up overall. It looks like the weather will be getting wetter and warmer, my daffodils are in full bloom, and I already have my next book ready to go. How was your February? Ready for spring? It is easy to keep track of your investments and net worth with a free account at Personal Capital.